Dr. Thomas J. Meschke and Dr. Aaron B. Swingdorf recommend that you visit our office at least twice each year for a routine checkup. 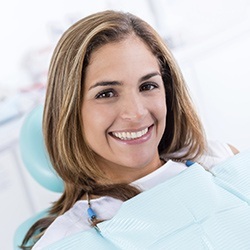 Patients of all ages benefit from these preventive appointments, during which we will check for the early warning signs of issues such as gum disease, tooth decay, and even oral cancer. Keep reading to find out why regular preventive care is so important for healthy smiles, then contact us today for an appointment with your general dentist in Chaska today! The particulars of a routine checkup can vary based on each patient’s age and unique needs, but the goal remains the same: prevention and early detection. Adult checkups focus on the health of your teeth and gums, as the risk for gum disease rises over age 35. Your dentist will inspect your soft tissues for oral cancer, periodontal disease, and other oral health hazards. We will also look at each tooth in your mouth to assess problems like tooth decay or cracks as well as old dental fillings. Sometimes, old dental fillings wears out and needs to be replaced. We can replace metal fillings, inlays, onlays, and crowns with tooth-colored alternatives. 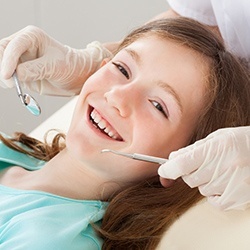 A child’s checkup includes looking for cavities, assessing how their permanent teeth are coming in, and evaluating whether or not early intervention orthodontics are necessary. Some issues, like an overbite and underbite, are most successfully corrected at a young age. Your children’s dentist in Chaska may also recommend dental sealants or a topical fluoride treatment for added cavity prevention. By examining your teeth and gums every six months, we can reduce your potential for developing large dental problems. For instance, a small cavity left untreated can grow to destroy an entire tooth and spread to the surrounding teeth. A cracked tooth can cause pain or break off and create additional problems. Advanced gum disease is the primary cause of tooth loss for American adults, and oral cancer causes more than 7,500 deaths each year. Caught and treated early, however, all of these problems can be controlled. When Should Children Visit the Dentist? Children as young as two should visit the dentist, and by age four or five, a child should attend regular checkups. Even before it’s time for your child’s own appointment, you can feel free to bring them into the office when you come in. It’s never too early to start getting them acclimated to the sights, sounds, and friendly faces of Chaska Dental Center! We use DIAGNOdent laser cavity detection to find cavities in the earliest stages, even before they can be seen with the naked eye (or sometimes even on a regular x-ray)! With DIAGNOdent, we can get a digital reading on the strength of your tooth enamel that indicates the presence and potential for cavities. Early detection allows us to provide the most conservative treatment, which ends up saving you time, expense, and possible discomfort later on!